I’ve said this before and I will say it again, for a long time I was not an Irish whiskey drinker. I also wasn’t much of a Bourbon/American whiskey drinker either, but that too has changed. Although I love Scotch it is certainly not the only great whisky out there and I am glad I’ve learned that. When I went to Ireland I learned that there are quite a few great whiskeys over there that we can’t acquire here and that is certainly a loss for us. You however don’t necessarily need to go to Ireland to try their great whiskey. Redbreast is an Irish whiskey I enjoy and think you might enjoy as well, if you are looking to try out a good Irish whiskey. 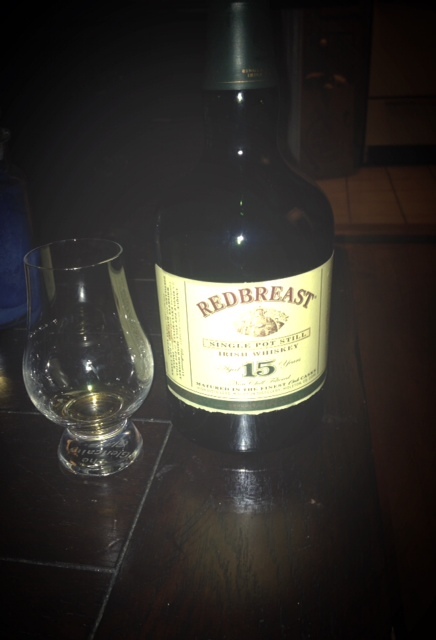 My introduction to Redbreast was with their 12 year Cask Strength (See my post from August 12, 2013: http://wp.me/p3Zt2k-v). Both the 12 and the 15 are Single Pot Still whiskies. Before jumping into the review I wanted to give a basic explanation of what a Single Pot Still whiskey is. Single Pot Still whiskies are unique to Ireland. Including unmalted barley to their mash and triple distilling in a pot still makes up a Single Pot Still whiskey. This started back in the 18th century because including unmalted barley with malted barley reduced the taxes distillers had to pay. Single Pot Whiskies were popular for quite a long time, however now to this day there are only two Irish whiskey brands that are really considered to be Single Pot Whiskies, they are Redbreast and Green Spot (one of my favorites and only found in Ireland. See my post on July 4th, 2013: http://wp.me/p3Zt2k-9). To me these are two very good and popular whiskies that may raise the demand for more Single Pot Still whiskies in the future. Aside from the years of maturation other differences are that the 15 year-old is matured in old Oloroso Sherry and American bourbon casks as opposed to the 12 year cask which is just matured in Oloroso Sherry Casks. Their is also a difference in cost, the 15 year-old is roughly more expensive, but the cask strength is also slightly more expensive than the original Redbreast 12 due to more alcohol content. I certainly enjoyed this whiskey. It is also a whiskey I own in my collection. I wanted to buy it but was happy to have received it as a Christmas gift from my boyfriend’s mom. The ear to ear smile when opening that gift was an indication that I was extremely happy about it. I recommend a try if you’ve never tried it. If not the 15 year the 12 is just as equally good. If you have tried it definitely share your thoughts. I’d love to hear it.